Now that the early hype around blockchain has died down, what do executives around the world really think about the distributed ledger technology that promises to transform everything from ingredient tracking to banking? To find out, researchers from Deloitte recently surveyed 1,053 senior executives in seven countries (Canada, China, France, Germany, Mexico, the U.K. and the U.S.) who are familiar with blockchain and with their companies’ blockchain investment plans. All respondents represent companies with at least $500 million in annual revenue. The key findings? While 44% of the executives believe blockchain to be overhyped — an increase from 34% in 2016 — 84% also think that blockchain technology is “broadly scalable and will eventually achieve mainstream adoption.” Moreover, three-quarters of the respondents report that their executive team sees a “compelling business case” for using blockchain, and 68% say that their competitive advantage is on the line. Sixty-five percent of the respondents say that their organizations plan to invest $1 million or more in blockchain technology over the next year, with 16% planning to invest at least $10 million. There isn’t significant geographical variation when it comes to blockchain investment, although companies based in Canada and the U.S. are somewhat more likely to have no immediate investments in blockchain planned. Respondents are drawn to blockchain for the greater speed promised by real-time information exchange capabilities, as well as to the possibility of new business models and revenue sources. Security is yet another major factor. The vast majority (84%) of the surveyed executives think that a blockchain-based solution would be more secure. Respondents working in automotive (73%), oil and gas (72%) and biotech, medical devices and pharma (72%) are most likely to agree with the statement that their industry will be disrupted by blockchain, whereas respondents in the public sector (46%) and food (50%) industries are least likely. Overall, three out of five respondents believe that the disruptive potential of blockchain applies to their industry. Although 43% of respondents say that their organizations consider blockchain to be one of their top five strategic priorities, there is a long list of barriers to greater investment in the technology. As the chart below shows, regulatory issues, implementation and security concerns are a few of the most common ones. The report authors point out that companies “still see blockchain as a technology-driven priority rather than a business one.” After all, the survey shows that blockchain efforts tend to be driven by IT (39%) or innovation or research and development functions (15%). Another 39% of respondents report that the business as a whole is driving blockchain efforts. 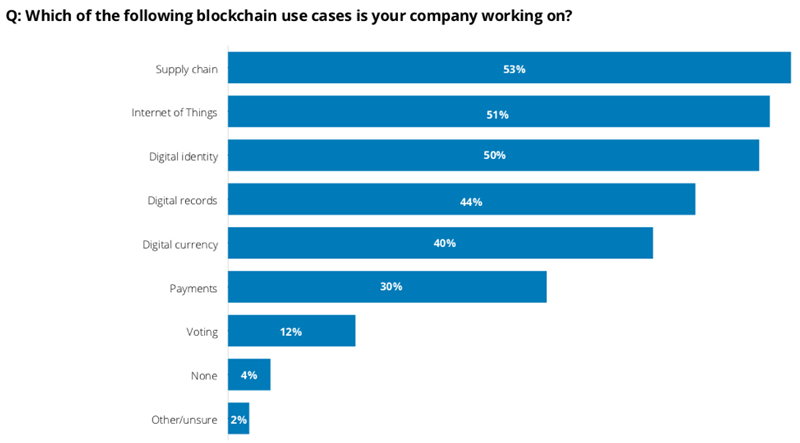 As the chart above shows, the most popular blockchain use case relates to supply chain. In fact, suppliers are the external stakeholders most likely to be asking about a company’s blockchain strategy, according to the survey, taking a stronger interest than customers, market analysts or partners. Concluding on an optimistic — or perhaps overly optimistic — note, the executives who took part in the survey tend to be highly confident in their understanding of blockchain, with 87% of those in the oil and gas industry claiming to have an “excellent” or “expert” understanding. Those in the public sector, in contrast, are perhaps more realistic, with only about half of the respondents proclaiming such expertise. The full report, “Breaking Blockchain Open: Deloitte’s 2018 Global Blockchain Survey,” can be found here.